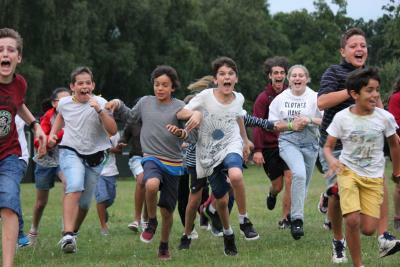 We play lots of fantastic games at our day and residential camps. Games are a brilliant way to get to know each other, work as a team, have a bit of competition and most importantly, have fun! The summer might be over six months away, but why wait until the summer to play some of our favourite games again? Round up your friends and family - let them experience some of our favourites. 1. All of the players are given two/three pieces of paper each (three pieces each will make the game a bit longer). On each piece of paper, players need to write a word, phrase or sentence. It can be ANYTHING, literally anything – a quote from a movie, your favourite food, something witty somebody said, a place, celebrities name, anything! Then fold each piece of paper individually and put it into the pot. 2. The first team will be given the pot with all of the pieces of paper in. One of the team members is nominated for the round and will have 60 seconds to take out one piece of paper at a time, describing it to his or hers team. If the team guess what is on the paper word for word correctly they can keep the piece of paper. If the team are unable to guess or the describer wants to pass, the paper can go back in. 3. Continue with the other teams, all having one minute each until the pot is empty. 4. Each team counts up how many pieces of paper they have. All players then fold the paper up again and put it into the pot. 5. The team next to the one who just went will begin the round. 6. During the 60 seconds, the nominated team member must say just ONE word to prompt the rest of the team to remember what is on the piece of paper. For example if the phrase is 'XUK Camps', you might say 'summer'. You can be tough and make them put the paper back in if they ‘um’ or ‘er’. 7. Continue with the other teams, all having one minute each until the pot is empty. 8. Each team counts up how many pieces of paper they have. All players then fold the paper up again and put it into the pot. 9. The team next to the one who just went will begin the round. 10. During the 60 seconds, the nominated team member must act out/mime what is on each piece of paper. They cannot use any words. 11. Continue with the other teams, all having one minute each until the pot is empty. 12. Each team counts up how many pieces of paper they have. All players then fold the paper up again and put it into the pot. 13. Add up the total score for each round and the team who collected the most pieces of paper during the game are the winners! We are always on the lookout for new, fresh ideas for games! If you’ve got any ideas or play something great between now and summer camp beginning, get in touch and let us know!